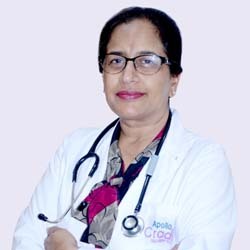 Dr. Meenu Arora is DGO, DNB Obstetrics and gynaecology with 23 years experience in Amritsar. She has done her research and post-graduation from Government Multispeciality Hospital sec 16, Chandigarh which is premier institute. She has been heading the department of obs and gynae in Sri Guru Ram Das Hospital near Shaheedan Sahib since then and has been handling normal and complicated case apart from having astute organizational skills. She keeps updating herself with the latest innovations and research in the field. Dr. Meenu Arora is life member of IMA, FOGSI and has delivered lectures in the upcoming trends in the subject. Dr. Meenu arora is now working as senior consultant Obs & Gynae in Apollo Cradle, Amritsar carrying forward the legacy of patient wellness, care and love which has always been reciprocated by her patients. Some of the services provide by the doctor are: maternal and child health, Infertility, all gynaecological surgeries, high risk pregnancy. I thank Dr. Meenu for her immense support and care. She was very kind hearted and always there for me when I was low. She gave the best treatment and constant care. Thanks to Apollo Cradle! I had my delivery at the Apollo Cradle, Amritsar. I had a wonderful experience here. Dr Meenu Arora and her staff were extremely friendly and cooperative with me. They are professionals and truly knowledgeable in their field. The entire staff works tirelessly for the timely, perfect care of both the newborn and mother alike. Apollo means all needed facilities under one roof. Apollo Cradle is the best thing that could have happened to me. I had my delivery in the Apollo Cradle and I am grateful for all the services provided to us. It is an excellent medical institution. First of all, I would like to mention Dr Kirpal and Dr. Meenu, who are great at their jobs. The entire staff of Apollo is quick and prompt regarding all the services. Additionally, they are equally cooperative and friendly towards the patients. I had my delivery in the Apollo Cradle under the care of Dr Meenu Arora. I would say that the decision of having my delivery here was a blessing! The facilities are of the highest order be it hygiene or food! Dr Meenu was extremely supportive throughout the process and the nursing staff was equally cooperative with me. Thank you for compassion, encouragement and understanding! I was recently admitted to the Apollo Cradle. I stayed in the luxury suite of the gynaecology and obstetrics department under Dr Meena Arora. The services were of the highest quality. I found the staff to be cooperative, patient and friendly. All my requirements were duly taken care of. I will cherish this time forever. In my experience at the Apollo Cradle, all the services and facilities offered by the hospital were great and measured up to the expectations. Dr Meenu Arora is really helpful. I also felt that the nurses and other supporting staff were very friendly, comforting and professional. I visited the Apollo Cradle for the delivery of my baby under Dr Manu Arora and can say with immense confidence that the hospitality and medical facilities offered at the hospital are unmatched. From the doctors and nurses to the administration and support staff, everyone was efficient, experienced and friendly, and made me feel very comfortable during the course of my stay here. I was treated under Dr Meenu Arora at Apollo Cradle and my experience here was great indeed. From the front office staff to the doctors, everyone was caring and fully aware of their work. Each and every service at the hospital was worth praise. The doctors are very knowledgeable and polite. Highly recommended! During the course of my stay at Apollo Cradle, I experienced no inconvenience at all. The infrastructure of the hospital is great with polite and knowledgeable staff. Dr Meenu is well informed and helpful. Food is of good quality too. I am highly satisfied with the services provided by the hospital. I would like to recommend Apollo to all my relatives. I really liked the services provided by the Apollo Cradle. The environment was very friendly, Dr Navdeep was cooperative and polite. Everybody performed their duties in an orderly manner. I faced no trouble whatsoever. The services extended by Apollo are sublime. I’d surely recommend it to others. I had a fulfilling experience with Apollo Cradle. I came here for the delivery of my child under the care of Dr Meenu and she made sure I was fully comfortable and surrounded by all the amenities. The staff, administration, housekeeping staff and doctors, all are skilled and professional. They treated me very kindly and with utmost courtesy. I am very happy with the services provided by the hospital. I would definitely recommend this hospital to my family. Mrs. Ruchi Kapoor – Amritsar. I was admitted to the Apollo Cradle, Amritsar for my delivery under Dr Meenu Arora. I would like to express my sincere thanks to Dr Meenu and her team for the brilliant teamwork. The staff was exceptional in providing me the comfort I needed. I had a wonderful experience and would surely recommend it to any of my expecting friends.